As 2015 comes to a close, we take a look back at how New Yorkers celebrated New Year's Eve a century ago, and learn that though some things change some things stay the same. New Year's Eve, 1907 at the Restaurant Martin in New York City. This photo was taken on New Year's Eve in 1907 at the Restaurant Martin, located at University Place & 9th Street in NYC. Those hats. In 1915 the Hotel Belleclaire at Broadway and 77th (still in operation today) offered a New Year's Eve party that covered all the necessities. A vintage postcard of the Hotel Belleclaire, still operating today in New York's Upper West Side. - A typical, good-natured New York crowd — with whom you will be glad to mingle. - Music—Lively and expressive of the occasion. -Dancing—as much as you wish of it. And though the New York Produce Exchange no longer stands at No. 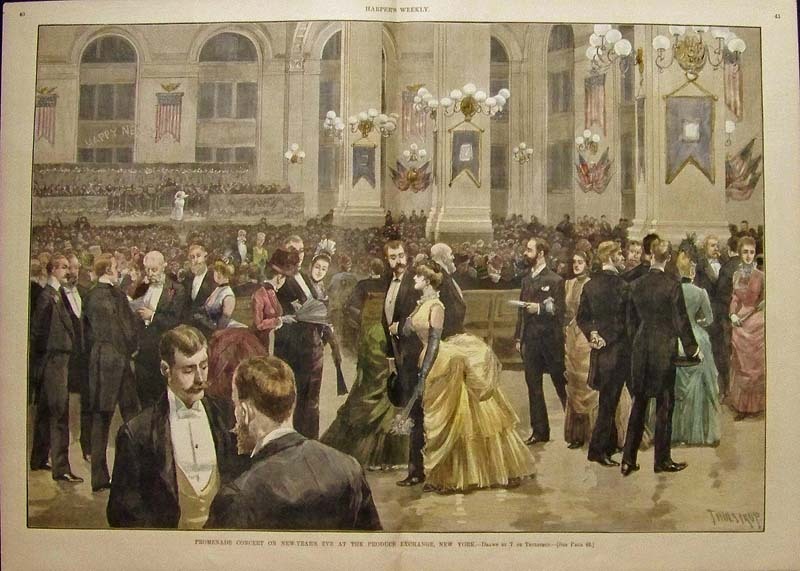 2 Broadway, a colorful print of the Promenade Concert that took place within the gigantic brick structure on New Year's Eve, 1887, shows us that dressing one's best for the big party is a long-standing NYC tradition. Wishing you all a grand and timeless New Year's Eve celebration, from all of us at Gray & Davis!